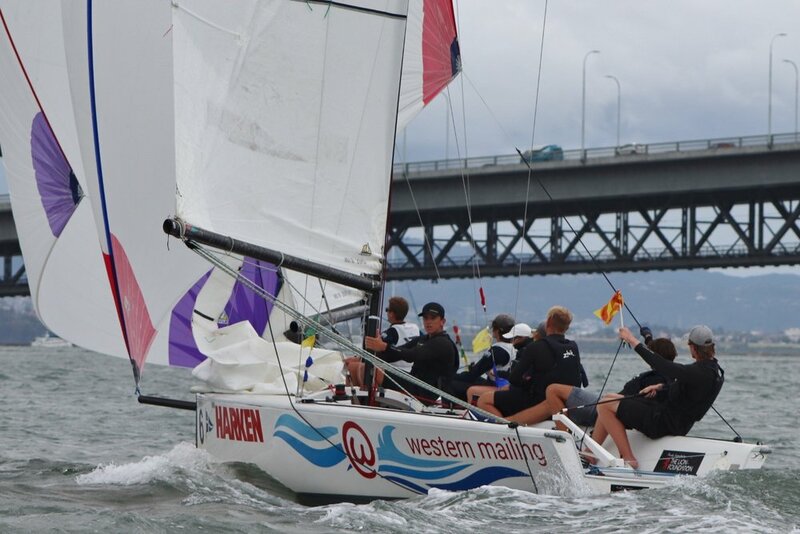 Robbie Young, Managing Director, Harken New Zealand, awarding champion KNOTS Racing Team. Nick Egnot-Johnson and his RNZYS Performance Programme KNOTS Racing Team – Zak Merton, Sam Barnett & Alistair Gifford – have notched up another big victory, taking out the 2019 Nespresso Youth International Match Racing Cup. Egnot-Johnson eased through his semi-final 3-0 against Callum Radford’s Royal Port Nicholson Yacht Club team from Wellington to cement his spot in the final. He was made to wait for an opponent though, with the semi-final between Jordan Stevenson’s RNZYS Youth Training Programme Vento Racing team and Tom Grimes’ team from the Cruising Yacht Club of Australia going right down to the wire. It was Grimes who was sitting in the box seat, taking the first two matches and leaving himself needing only one more victory to meet Egnot-Johnson in the final. Stevenson wasn’t going to have a bar of that though, and as he has done before, pulled up his socks and pulled off an amazing comeback – winning the next three matches to send Grimes reeling into the petite final and himself into the big dance. The all Squadron final also did not disappoint, with some incredibly tight racing, tacking duels and speedy downwind sailing. Both teams’ traded close wins to send the final into an epic fifth match to decide who would be champion. However after what was a very exciting pre-start, and in what was Stevenson’s 10th match of the day, him and his team made a costly mistake and were ruled to be over the start line before the horn. This gave Egnot-Johnson a decisive lead that he would not relinquish, allowing him to sail his Knots racing team to the overall victory.